THE WORLD MEETING of Families is seeking 4,000 Eucharistic ministers to volunteer at the Pope’s Mass in Dublin’s Phoenix Park next month. In a post on its website, the WMOF states: “We are seeking the generous help of around 4,000 ministers of Holy Communion to volunteer for one day to be Christ’s disciples helping to give the Bread of Life to the people at this historic Papal Mass. The statement notes that in the region of 500,000 people could attend the Mass on Sunday, 26 August. As reported in the Irish Catholic, volunteers wishing to apply “need to be already trained and functioning ministers of Holy Communion” and must be garda-vetted before the event. 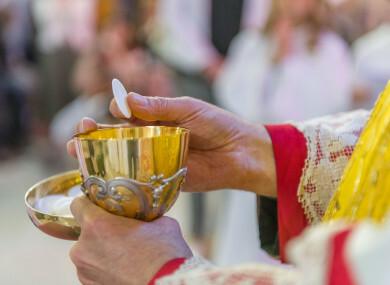 It notes that preparation for the Mass has been underway for several months, and that “well over half a million hosts” as well as 4,500 ciboria (chalice-like instruments where the communion hosts will be kept) will be available. “It is our hope that we will be able to distribute whatever Holy Communion is left over from the Papal Mass to hospitals and nursing homes all over the island, so that those who weren’t able to be present and who followed the Mass on television can receive from this tremendous Godly event,” the statement adds. Email “4,000 Eucharistic ministers who are 'steady on their feet' needed for Pope's Mass”. Feedback on “4,000 Eucharistic ministers who are 'steady on their feet' needed for Pope's Mass”.